Our 20 oz. classic Moscow Mule, single wall mug is made from handcrafted solid copper and features a brass handle. Due to the handcrafted nature of this item, minor imperfections are normal. Originally created in a Hollywood bar in 1941, the Moscow Mule mug and recipe has stood the test of time and is experiencing a huge resurgence in popularity all across the country today! Our 20 oz. 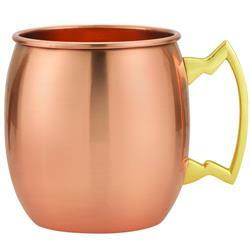 classic Moscow Mule, single wall mug is made from handcrafted solid copper and features a brass handle. Due to the handcrafted nature of this item, minor imperfections are normal. Comes Gift Boxed.